Shop Shure Beta 87A Vocal Condenser Microphone from AMS with 0% Interest Payment Plans and Free Shipping. The Shure Beta 87A is a precision-engineered supercardioid condenser vocal microphone with an exceptionally smooth frequency response. Built to withstand extreme sound pressure levels, the Beta 87A is ideal for professional sound reinforcement and studio recording applications - and constructed to withstand the rigors of touring. Highly consistent supercardioid polar pattern provides superior gain-before-feedback. 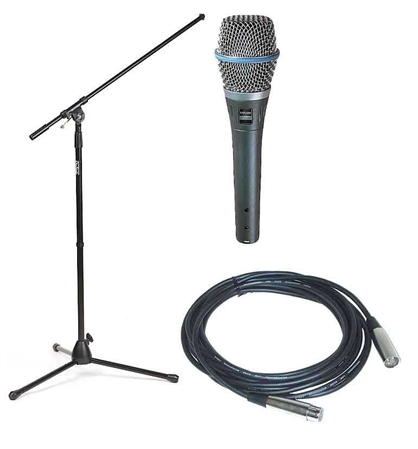 The tight supercardioid pattern, with null points at approximately 125 degrees, provides maximum isolation from other vocalists or instruments while offering minimal off-axis coloration. The Beta 87A operates on phantom power. The Beta 87 has consistently been a top choice of performers and audio technicians around the world due to its superb accuracy and detail, and rich vocal production. This long-standing favorite now features a new design and has been renamed the Beta 87A. In response to user requests, Shure has redesigned this microphone by just slightly thickening the handle for a more comfortable feel when hand-held. In addition, the Beta 87A now includes the A25D break-resistant swivel adapter. *S/N ratio is difference between 94 dB SPL and equivalent SPL of self–noise A-weighted. great sound quality vocal microphone. Use the beta 87 for lead vocals, and the sm86 for background vocals. The Beta 87 provides great sound. Love this mic. It’s perfect for live performances with my band. I had tried a shure dynamic mic but due to my vocal processor, could not get the proper volume levels. So tried the condenser and it’s absolutely perfect! My boyfriend has been in a band for 15 years and suggested the shure mics to me and I really could be happier with the quality. Highly recommended! If your looking for the best lead vocal mic, this is it. I've used 58s/57s for years. Should have upgraded years ago. Excellent clarity and mid range boost...sounds great! This Mic is worth the money.. I would say this is far the best mic..love it!! This Mic is far the best Mic I have in my gig bag..well worth the money..you are only as good as you're equipment!! This is simply the best vocal mic ever. I tend to move around a lot when I sing and this thing picks up my vocals anyway! It produces a beautiful sound - couldn’t be happier. Love this mic!! It’s perfect! Worth every penny. I will buy more of them. When I’ve used it at worship practice and on stage I get compliments on it.